The Red Devil Pleco (Pseudacanthicus pirarara) is also known to tropical fish keeping enthusiasts as the Scarlet Cactus Pleco, Cactus Pleco, Scarlet Pleco, or their formal identification as L025. It is a relatively new unnamed species that was discovered in the lower to middle Rio Xingu, Sao Felix, Senador José Porfírio, Pedral do Caitucá, the Rio Bacajá and the Rio Iriri in Brazil. Red Devil Plecos are found in clear, fast flowing, highly oxygenated warm water rivers and streams and are mostly a nocturnal species. The leading edges of the fins of Pseudacanthicus pirarara are colored scarlet to reddish orange, which is most pronounced on their dorsal and caudal fins. The Red Devil Pleco is a large pleco that in their natural environment can grow to over 17 inches in length. Although both males and females posses pectoral odontodes, adult males have noticeably more odontodal growth on their fins, especially on their pectorals. Males are usually more brightly colored than females and as the fish grow, the males become longer and more slender in appearance, compared to the chubbier and shorter females. “hooded” which give the fish an unusual, almost evil look; hence their name. Red Devil Plecos cam be housed in at densely planted aquarium of at least 70 gallons (preferably larger) with a fine smooth gravel or sand substrate, plenty of driftwood , some rocks that are formed into caves for them to hide among, and some floating plants to diffuse the lighting in the tank and discourage jumping. They need at least one power head or a canister filter to provide the fast flowing, highly oxygenated water they require to keep them healthy, and are best kept in a Loricade or single species tank. Juveniles are particularly susceptible to nitrite and ammonia spikes so over filtration is recommended. Red Devil Plecos are shy, reclusive, and non-aggressive to other bottom dwellers and as long as other species in the tank do not infringe on their space, or cave that they have staked out, they can be housed with other omnivorous species. However, they are extremely aggressive and territorial towards conspecifics. Barbs of all sizes seem to get along well with them in a mixed species tank. Although many tropical fish keeping enthusiasts house them with Oscars, Cichlids, or other large Loricariids; it is not a good idea to do so. They are quite messy and like all plecos will produce a large amount of waste. In addition, because they are largely nocturnal, they will aggressively defend their territory and may cause problems when housed with similar sized nocturnal species. 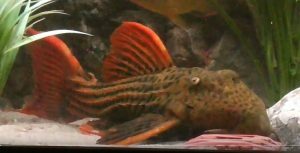 Breeding Red Devil Plecos in an aquarium environment has not been successfully documented however some fish are being sold online as domestically raised breeding pairs. Although Pseudacanthicus pirarara are not predators, they are primarily carnivores that have a healthy appetite. They will accept omnivore sinking wafers when they become acclimated to your tank but prefer live, frozen, or freeze dried prawn, chopped mussel, small pieces of fish, mysis shrimp , bloodworms , etc. Round out their diet with some vegetables or Spirulina wafers on a regular basis. 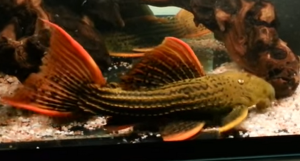 Red Devil Plecos are an uncommon species that are priced in the hundreds of dollars, if you can find one for sale. They are occasionally sold in specialty fish keeping shops and online at ridiculous prices.